If you've ever seen the scary red pages in Google Chrome that prevent you from visiting a dangerous website, and wished you had them on your phone, then you're in luck: Google has extended Safe Browsing, the technology behind those security alerts, to Android. Safe Browsing is now integrated into Google Play Services, starting with version 8.1, and apps are able to use it. Chrome for Android is the first to do so. As in the desktop version of Chrome, Safe Browsing protects against websites that are known to host malware, potentially unwanted programs as well as phishing and other scams. If you've surfed from an Android phone extensively you've probably been bombarded with persistent ads claiming that your phone is not running properly, that your battery drains too fast or that the device is insecure. All of them try to push some application that allegedly solves the made-up problems. 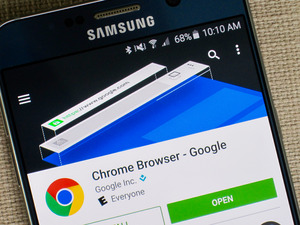 Since Chrome for Android, unlike the desktop version, lacks support for extensions and therefore does not offer an efficient ad-blocking solution, users will hopefully be able to rely on Safe Browsing to weed out deceitful ads and Web pages. According to Google, implementing Safe Browsing on Android was not easy because mobile data plans have limited bandwidth, especially in some regions of the world. That's why some decisions had to be made to keep the list of blocked websites up to date and as small as possible when downloaded by devices. "Some social engineering attacks only happen in certain parts of the world, so we only send information that protects devices in the geographic regions they’re in," Google said in a blog post. "We also make sure that we send information about the riskiest sites first: if we can only get a very short update through, as is often the case on lower-speed networks in emerging economies, the update really has to count." The Safe Browsing and Android security teams also worked together to make sure that the technology uses as little processor and memory resources as possible, in order to keep the impact on the device battery minimal. Users can check if their version of Chrome for Android has Safe Browsing enabled by going into the Settings > Privacy menu.